Which Flower By Kenzo Fragrance Is For You? 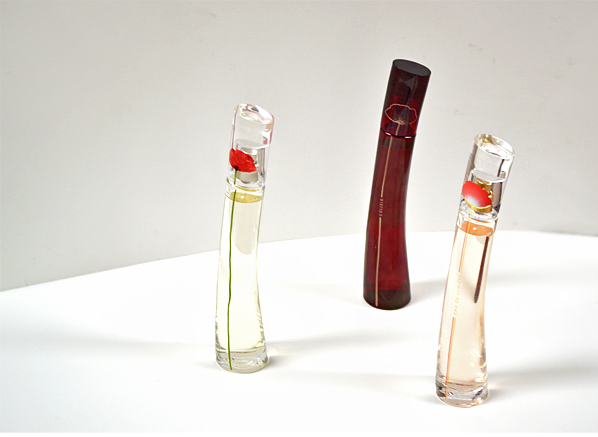 When we talk about the modern classics and icons of perfumery we often refer to the same scents. These are what I like to call ‘The Usual Suspects’ and you know them well, they are the likes of Angel (an olfactory Keyser Söze if there ever was one) CK One and Coco Mademoiselle etc. Very little is said about one particular icon though – a fragrance that has been quietly brightening the lives of many people around the world for nearly 20 years. That fragrance is Flower by Kenzo. Flower by Kenzo launched in 2000 as a new bloom for a new millennium. Designed to perfection, Flower has been crafted away from nature and represents an abstract flower that doesn’t exist in real life. This fantasy floral is represented by the poppy, a scentless flower (technically a weed, actually) that adorns the flacon in different stages of bloom dependent on the bottle size. Flower by Kenzo may not be the boldest olfactory signature out there, nor is it the most divisive, but it most certainly is one of the prettiest – and there’s always room for beauty in this world, if you ask me. Over the years Kenzo has arranged their flagship Flower into many different bouquets, with the most recent being Flower by Kenzo Eau Lumiere, a brand new and exciting take on Flower that is an essay in golden light. To celebrate the launch of this beautiful new bloom I’m taking you on a tour through Kenzo’s expansive poppy field to showcase three of their most eye-catching and nose-pleasing blossoms. We’ll be sniffing three varieties; the iconic original, the delectable L’Elixir and the sparkling new Eau Lumiere. It’s going to be lovely! Without smelling like a particular bloom or even a bouquet of floral notes, Flower by Kenzo creates the image of an imagined flower by using isolated facets that are often found within floral compositions. The most prominent of these nuances is a powdery warmth that represents the glamorous powder-based florals that have dominated the landscape of modern perfumery for over a century. This is paired with an almond-like heliotrope note that pays homage to the vast arrays of violet-like florals we all know and love. Vanilla and musk add a finishing touch of fleshy, sweet petals, turning Flower by Kenzo into a carefully pieced together floral that is unlike any in nature. Flower by Kenzo is a really comforting fragrance, without being overly warm and heavy. It’s the kind of scent that leads one to think of nuzzling their nose into the softest cashmere in the brightest shade of white. This is abstract perfumery at its very best, where an image is created of something fantastical – a flower that will take a different form for every person who wears it and one that will bloom on the skin of beautiful women for another millennium to come. Flowers are often celebrated for their aesthetic beauty as well as their scent, but their flavour is still something that is underrepresented. For me, flower flavours are some of the best and I will literally scoff anything that has even a mere drop of rose or violet in it because they simply make the best treats. Kenzo’s L’Elixir version of Flower is one such edible delight, and it takes Flower to an entirely new level by stirring it into a bowl of utter deliciousness. Flower by Kenzo L’Elixir is two spoonfuls of rose water and orange blossom water folded into praline and vanilla. It’s creamy and soft with a nutty, juicy quality thanks to the mixture of red berries and dark chocolate. Interestingly it smells nothing like the original and it isn’t particularly floral, but it does share the abstract nature of Flower by Kenzo by present edible facets that represent so many things but come together in a way that is entirely new. You may not be able to find this delicious treat on a menu somewhere, but you most definitely can wear it in L’Elixir. And now for the newness. Eau de Lumiere is the latest take on Flower by Kenzo and as the name suggests it is something altogether more luminous. Created to display light, Eau de Lumiere feels as if it is Flower by Kenzo captured at dawn, just as the dew starts to dry from its petals and as the sun rises to bathe it in warm light of morning. That sounds rather pretty doesn’t it, but I know you’re dying to find out what it smells like so I shall not leave you in suspense any longer. 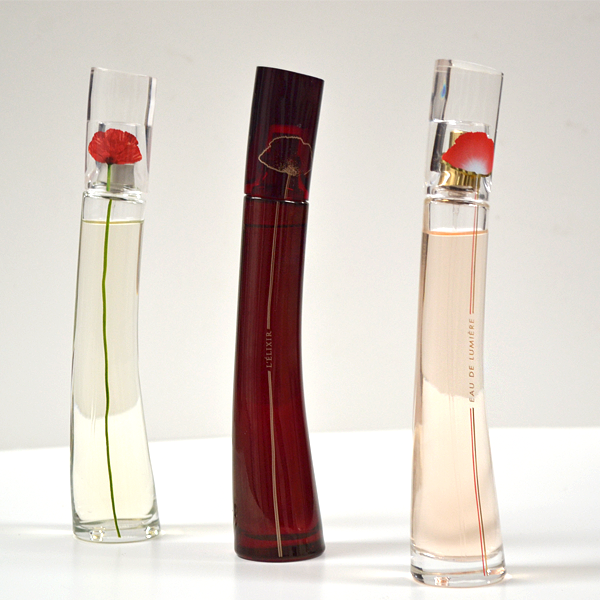 Eau de Lumiere is decidedly less abstract than the original Flower by Kenzo. It presents a refreshing citrus note that is clear and bubbly with a warm glean. At its heart, Eau de Lumiere breaks tradition and chooses a single flower to showcase and what could be more appropriate than the queen of all flowers – the rose. This isn’t a bold red rose though, no, instead it’s a golden yellow rose with a soft, ambery texture and wrapped in a veil of white musk. Eau de Lumiere isn’t just a sunnier take on Kenzo’s flower, it’s an entirely different specimen altogether and a gloriously dazzling one at that. This entry was posted on Wednesday, April 5th, 2017 at 10:27 am and is filed under Brand Focus, Candy Perfume Boy, Fragrance. You can follow any responses to this entry through the RSS 2.0 feed. You can skip to the end and leave a response. Pinging is currently not allowed.